I had the opportunity to review a copy of 21 Days to a More Disciplined Life by Crystal of Money Saving Mom this weekend. 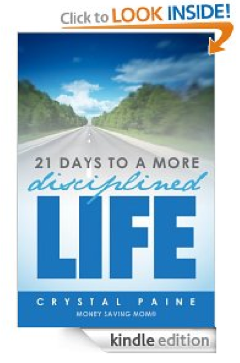 21 Days to a More Disciplined Life is a very inspiring read. I read it at night and couldn't sleep afterward. My mind was racing with all the great ideas Crystal shares! -"I am the problem, but I am also the solution." Crystal makes this statement and I think it is brilliant in its simplicity. When I change my mindset to how I can make changes in my life, I am more likely to be successful. -Make small changes over time. Crystal encourages making one change into a habit before adding a new change to work on. I know in my life I like to overhaul my whole life in one day and within a week I am back to my old ways. Soo...I am going to take Crystal's advice and start with one habit at a time. I also really like that Crystal walks you through finishing a Mega-Project. This book stresses actions, which is so important. Reading an inspiring book without acting on the principles doesn't create change! I could write on and on about all the great ideas in this book, but I will instead encourage you to pick up a copy. Crystal is offering an incredible .99 special through Thursday, October 25th. You will be inspired and encouraged by this e-book. I am going to work on healthy living for my mega-project. If you are going to pick up this book, I would love to hear what you will be working on. I can't wait to get started! **I received a copy of this book to review, but all opinions are my own.